Award winning, all suite hotel, all rooms with microwave, refrigerator, wet bar, hair dryer, large work desk, full size coffee maker, iron/board. Free high speed internet and nationwide calls, deluxe HOT breakfast with hot waffle maker, 24 hour coffee bar in lobby, 24 hour complimentary business center, exercise facility, airport shuttle service (paid service) Outdoor pool. Varies from 48 hours to 30 days in advance of arrival date. We gladly accept household pets(no exotic pets allowed).Pet's owner must sign "Pet Agreement" at check-in. $15/pet/night charge applicable. Local Shuttle Info: Each evening we offer free shuttle to Fourth Street Live entertainment district in Downtown louisville. Parking is complimentary during your stay. We also offer Park & Fly packages. The latest premium economy and midscale hotel brand offering comfort, value, and exceptional customer service. The SureStay Hotel Group consists of three brands: SureStay Hotel, SureStay Plus Hotel, and the SureStay Signature Collection to meet the needs of all guests whether traveling for business or leisure. At any location, guests can enjoy free Wi-Fi, breakfast, comfy bedding, and everyday low prices. SureStay Hotels offers basic comforts at a great value with modern, but simple furnishings and large TV’s in each guest room. At most locations, guests can enjoy a pool, fitness facility, continental breakfast, and guest computers during their stay. 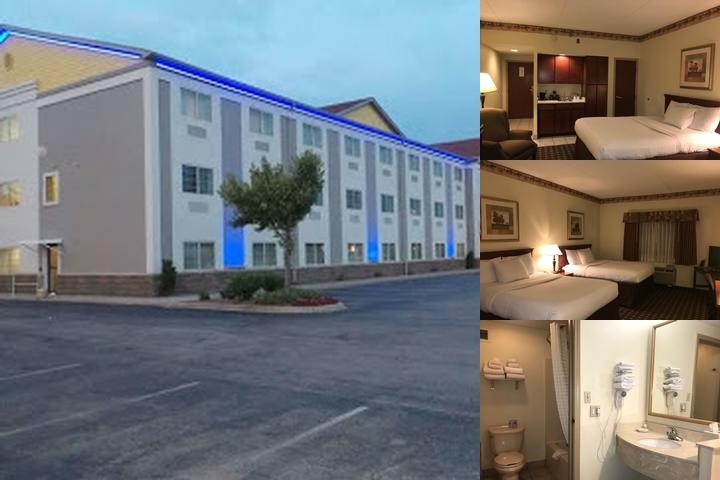 Delivering additional comfort and affordability, SureStay Plus Hotels features contemporary guestrooms with plush bedding and pillows, flat screen TV’s and free Wi-Fi throughout the hotel. At most locations, guests have complimentary use of computers and printers, a higher-end fitness facility, swimming pool, and indulge in a free hot breakfast served daily. The SureStay Signature Collection offers boutique living at an exceptional price with properties located in historic buildings or in smaller, character buildings ideal for travelers looking for a unique hotel experience. Every guest room delivers in charm and luxury with plush bedding, upscale design elements, and bath amenities for ultimate relaxation. At most locations, all guests have access to free W-Fi throughout the hotel, complimentary hot breakfast daily, on-site dining options, and a state-of-the-art fitness facility and business center. SureStay Rewards will soon be offering an instant-rewards guest loyalty program to earn and use points for hotel stays, dining, and more. The SureStay highlights above are subject to change without notice. 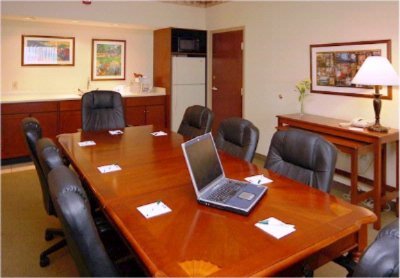 Below are the meeting, banquet, conference and event spaces at SureStay Plus Louisville Airport. Feel free to use the SureStay Plus Louisville Airport meeting space capacities chart below to help in your event planning. Hotel Planner specializes in Louisville event planning for sleeping rooms and meeting space for corporate events, weddings, parties, conventions, negotiated rates and trade shows. The Conference Room. Room has two sleeping rooms on either side connected, great for weddings, family reunions etc. Counter space for food (outside catering allowed), fullsize refrigerator, microwave and sink included. Room also has attached hand sink and full bathroom. 20 x 30 x 10 Ft. The Hospitality Suite. Two couches, which are fold out beds, plus two chairs make this the perfect room for your hospitality use at any of the major trade shows that are hosted in Louisville KY. The full size refrigerator, microwave, full length counter and sink make food service (outside food service allowed) simple and easy! 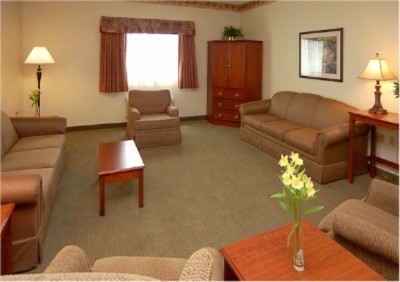 This room has four guest rooms connected making it perfect for family reunions, weddings and other social events! Located just 100 yeards from the hotel. This meeting/banquet room is on the 2nd floor above Puckers Bar and Grille. Food/drink service is available from the restaurant below. 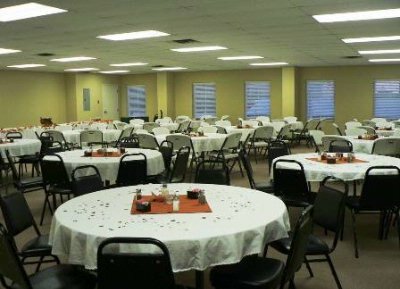 The meeting room can accommodate 100 people while the restaurant can accommodte 150. Contact us today to check out your options! 75 x 33 x 8 Ft.
20 x 15 x 9 Ft.